Do you paint or draw? Do you plan ahead and plot the course and then replicate these designs on a grand scale? Or do you sketch it out in the rough, and then begin to paint; accepting any happy accidents or organic changes as they come? I began 73 cents as a design rendering and then began to sketch it upon the brick wall. I wasn't happy with this method. I instead began to paint it in its entirety in little pieces. It was almost like one of those magic drawing books I got as a kid. 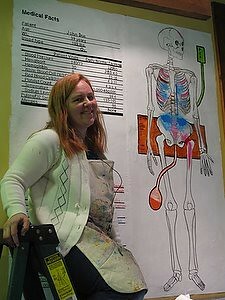 I would rub a quarter or a pencil over nothing and then parts of an elaborate drawing would appear. What magic! Life is like that sometimes. It doesn't always work out like you planned and you finish parts of the picture at different times. I got to know Fred in scenic painting class in 1992. He was taking the class for graduate credit. He could take either costume construction or scenic painting. He thought painting would be easier. I remember him using the words "blow off" class... I was a second year freshman barely passing my classes, but pretty good at painting, so I enrolled in it as well. Every week we were assigned to paint a 5'x5' canvas. The rest of the class would come and go all week and get it done gradually. Fred and I both liked to procrastinate. Each week we would show up at nine or ten. We would paint all night. I got to know Fred by pulling all-nighters with him for months. There is no better way to get to know the real person than pulling all-nighters. Have you ever pulled an all-nighter? You aren't exactly chipper and bright are you? Fred would show up dressed in Metallica sweat pants. 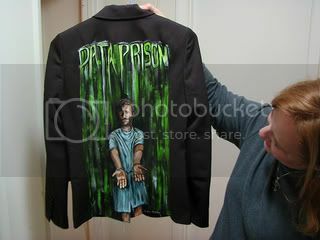 He would be wearing an Anthrax t-shirt under a magenta dress shirt. The ubiquitous walk-man tape player would dangle from his pocket. He listened to hard rock so loud I could hear it from ten feet away. I would paint silently. He would go on and on about news from Entertainment Weekly and Premiere. I would paint silently. He would frantically gesticulate while painting and quote ALL of the movie Star Wars from memory. I finally set my brush down and said in my most put-upon voice, "You are a walking advertisement for the entertainment industry!" He looked at me with his infuriating smile and said, "I take that as a compliment." Back to work he went with a jaunty step and that silly smile. I was furious. I threw a sponge at him. It was a wet sponge. He got rather wet. he,he, he... A little later he came over to me with a can of Pepsi and poured liquid all over my head. I could not believe he drenched me in Soda! (It turns out he didn't. He had replaced the soda with cold water, but wasn't going to tell me.) I was doubly furious. It was full on wet sponge war at three in the morning on the Main stage. We finished our rather splotchy paintings and went our separate ways; for about thirty minutes as we had class at 8:00 am. Any third grader could have told us... we were falling in love. We finished the semester and went to our homes for Christmas. After a few days without Fred, I missed our fights. I called him up when he was back from break. I asked him if he would go with me to a party to Peter's house. He said, "Sure, I will drive you. I know you don't have a car." The minute we got to the party he went in the other room with the guys and talked about the God-Father Movies. Peter played dance music. I asked Fred to dance. He said, "I don't dance." I was running out of ideas... Fred asked me if I would like to see the movie "The Fisher King" at his place. I said yes. We went to his place and began to watch "The Fisher King" He began to tell me all about the actors and the director. He was talking a mile a minute. I kissed him. He got the hint. We were engaged two months later. We were to be married on December 26th 1993. We were so poor. I sold all my comic books to pay for the wedding invitations and Fred sold all of his comic books to pay for our rings. He was a DC fan and I was Marvel so it was a rather rocky engagement. But hey, we liked to argue! I wore my mother's Wedding Dress. Fred wore a nice suit. Poinsettias were the wedding Flowers as the Church was already decorated for Christmas. It was beautiful wedding. That was sixteen years ago. We never had a honeymoon. We were too poor. We said we would go on one of those cruises or something for our twentieth anniversary. We never had anniversary gifts. It seemed a bit greedy with our anniversary the day after Christmas. We would go out each year for dinner and a movie to celebrate. Fred and I loved this yearly date. Most years of late, we would see Harry Potter. Fred was so disappointed last year when the Christmas release of "Harry Potter and the Half Blood Prince" was pushed back to July. He joked, "I guess we will celebrate in July this year." In July, I hired a baby-sitter and went by myself to a movie for the first time in 16 years. I watched "Half Blood Prince" with tears streaming down my face. Fred would have liked the movie. So, here I sit on my 16th wedding anniversary. I am living in the rough sketch. I am not sure what is coming next. It was about this time in 1992; I realized I missed that zany guy named Fred... and I still do. I watched the "Fisher King" again not to long ago. It was a perfect first movie for us. It has a great message. When the love of your life dies it is okay to go a little crazy, but it is important to help others along the way. If you are torn up by grief and remorse, do not give up hope. You can change things. I doesn't matter if you are a shock-jock, a professor or an artist ... you can make the world a better place. Anyway, going back to the concept of projection. When I was in third grade, I was cast as the lead in our elementary school musical. I was the Witch in "The Witches Brew." This was a big part with lots of singing. I was so excited I got the part, especially since ... I couldn't sing. What I mean to say is, I could belt out the songs; but had absolutely no sense of pitch or tune. So imagine my joy and surprise at being cast! I loved to sing; I just wasn't any good at it. A few weeks into rehearsal, I accidently over-heard my music teacher talking to another instructor. She told the other teacher, " Yeah, Regina's singing is horrible! I cast her because she is LOUD. It is more important to be heard, then to be able to sing." I quietly slipped out. It was very hard to go to sleep that night. I wondered if I could go on stage, in front of all those people, knowing I was terrible. I decided to concentrate on the good part. I was loud. I would be very good at being loud. This is an important lesson to learn in life. We cannot change a lot of what happens to us, but we can choose to always look on the bright side. Even when you are hit by tragedy, you can decide to take on the world and make it a better place. I may not be a good singer. I may not be a very good artist, either. But I am loud. Sometimes it is more important to be loud. It helps to get the message across. As we say good bye to 2009, I am very glad I was able to use my voice to promote health care reform, patients' rights and data access. And even though I am a terrible singer, I sang briefly on NPR. My music teacher would be so proud. So next time you think you aren't good enough to add your voice to the public debate, think of me. 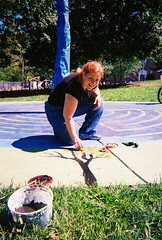 I was only a retail sales clerk , pre-school art teacher and part-time muralist. When the message is important, God doesn't care if the trumpet is shining and bright. He doesn't even care if it is in tune. He just needs it to be loud. I remember New Year's Eve Day 2008. I was at the Toy Store. I was finishing up for the day and told Steven, the store manager, that I could not wait for 2009. I said 2008 was so bad it must get better in 2009. Steven just looked at me and said, "2008 was great for you guys. Freddie got to go to Ivy mount and Fred got his dream job at AU." I suppose it seemed from the outside that I was complaining for no reason. But 2008 was very hard. 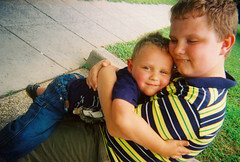 In 2008, we got the test results for Freddie that said he had high functioning Autism. We had to make a choice to fight for placement in a special ed. Program. In special ed books, they say it is like planning a trip for Paris and ending up in Iceland. Iceland can be a very nice place, but is a shock to give up your plans of Paris. Fred took it very hard. We went to family counseling for 5 months and paid out of pocket as we were not insured for this therapist. He was a wonderful Dr. and cut our bill in half due to need. We were working constantly and in a tiny apartment in 2008. Fred worked 3 part-time jobs. I worked two part-time jobs and one full time job. Fred and I split the childcare between the two of us. We hardly got to spend any time together. We looked forward to a therapy sessions just because we had 30 minutes to eat lunch on the doctor's stoop before we would meet. It was great. We called it our date. We would eat gas station hot dogs and just talk to each other. In the summer of 2008 Fred got word he would be hired by American University in the Fall. We were so happy. I went to part time at the toy store and Fred began work in two departments at AU. He was very tired and frustrated a lot of the time. He couldn't understand why it was so hard to do his job and why he had so little energy; but he buckled down and worked hard. Most of his students loved him. The fall came and went. Freddie missed his old friends from his old school. Isaac seemed to be doing well in his two year old class at CCBC. I juggled childcare and two jobs. Fred finished his first semester at AU. By New Years, I was pretty worn out. I left the store on new Year's Eve and went by CVS and bought a can of Fosters Beer. I thought Fred and I could share it that night. In January, Fred began to teach again. He his chest hurt. He went to the ER and they said it was cracked ribs from coughing. In February, everything got worse. We were all sick with a very bad cold. Our computer was fried by a virus and while we were trying to drop it off at Best Buy our car died in the lot. This was Valentine's Day. Fred and Freddie rode in the Tow truck to The BP station (Where the mural is now). I pushed Isaac in the stroller. It was raining and I was sick with a cough. THe CCBC auction was on the 21st and coughed through drawing 100 children's portraits. Fred was without a home computer so, in pain, he would go each night to his office at AU and respond to email, do Blackboard and Facebook. We began calling February "Cursed February." Fred kept going to his doctor and she kept giving him pain pills. In March. Our. life. fell. apart. On March 27th we found out Fred had tumors in his kidney and his abdomen, by March 29th we would know they were in his lung's and bones. I would sit in front of a computer screen at 4:00 in the morning researching his disease. They all said the same thing... Fred would only live for a few months with his state of the disease. I read this alone and no doctor would talk to me. No one would tell us truth. On March 31st we celebrated Fred's 39th birthday party. In April, we would celebrate Easter in Fred's Hospital room. We hid 48 eggs for Isaac and Freddie. Fred watched them find them. On April 19th Fred's oncologist would say he was sending us home on a PCA pump. Fred would tell me to go after them. We transfered to a new hospital. We spend three weeks there. In May, we would leave the new hospital and go to rehab. This was Fred's last attempt to try to get better. He endured so much pain. He tried to sit while his spine was dissolving. My birthday was May 10. we had a hornet in the room. I ended up killing it. Freddie says it was one of the only good memories of Daddy's cancer care. By late May Fred was failing fast. We would decide to go to hospice. Murch and St. Paul's Lutheran Church would host a rummage sale for us. I would place the first mural. 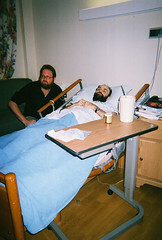 In June, Fred would be in Hospice until we got into a new two bedroom apartment. W e moved on June 10th and Fred came home on June 11th. When Fred and I were engaged back in 1993, we had a engagement photo taken and had it put in a grand frame. Then we left it at our in-laws house until we had a place nice enough to hang the picture. For the first time it hung in our apartment on June 11th beside Fred's bed. Fred lived for 6 more days and died on June 17th. There the year stopped. Everything thing that has happened since happened to some one else, because part of me died that day. On June 23rd I began 73 cents. Since then I have never stopped thinking of Fred. I have never stopped fighting for the rights of people like Fred. We only had less than three month together after March 27th. It is hard enough to be dying. We should not have suffered so. No one should suffer so. It has been a very hard year, but I am thankful. I am thankful for my two precious sons who look at me with Fred's Eyes. I am thankful for all the great people who came and helped us in our time of need. I thank the BP station, Pumpernickels and The American City Dinner for the Walls they gave. I thank Christine Kraft who introduced me to Ted Eytan, Claudio, Susannah Fox, Cindy Throop and Epatient Dave. They have all been stalwart friends. 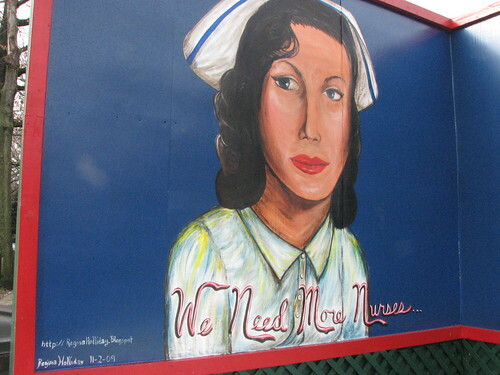 I thank the reporters who came to the Mural and spread the word about how much we need medical records access. I want to thank all the families, students and Staff at Towsen, American University, CCBC, Ivymount and Murch Elementary who helped us so much. Thank you too to all the Folks in Western Maryland who fundraised for us. Thank you to St. Paul's Lutheran in DC and St. John's Lutheran in Accident. Thank you to my primary care Doctor and all the medical personnel who tried to help us. I want to thank God. For in our darkest hour he stood beside us. The spirit of the Lord uplifted our soul. Never doubt there are miracles. We are living in the miracle. This New Year's Eve I will open that can of Fosters that still is sits in our Fridge. I will toast Fred and 2010. i miss him. I love him. The world will never forget him. He was a good and kind man. He deserved better, as do we all. I have been thinking a lot about Titanic these past months. Fred and I loved that film. We saw it three or four times in the theatre. It had everything: art, tragic love, action adventure and amazing special effects. 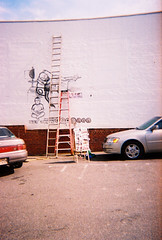 As I worked on the Mural "73 Cents" in August, I thought of Titanic. I was often asked, "Why do we need to fix our health care system when it is the best in the world?" This statement reminded me of Titanic. It was the biggest and best of its time. It was the unsinkable ship. It was was grand and out-fitted with the best that money could buy. Amongst all the fine things on the Titanic, one of the most important things was unfortunately ignored: the wireless telegraph. Charles R. Pellegrino, who writes as an authority in such diverse topics as entomology, forensic physics, paleogenetics, preliminary design of advanced rocket systems, astrobiology, and marine archaeology, wrote quite a bit on the topic of Titanic. I was intrigued by his depiction of the wireless operators. There were Macaroni operators on Titanic. They were paid to send message to and from the mainland for the well-to-do aboard the Titanic. On Sunday, 14 April 1912 while working on and endless stream of personal messages the Titanic operators were hailed by the wireless operator of the Californian at 23:00 hours. He was trying to warn them of ice floes in the water. Now wireless telegraph was a lot like Twitter: Only 140 characters & broad spectrum communication There were a lot of messages coming in and the Titanic operators were sending messages @Cape Race. This tweet from the Californian @Titanic was really messing with the Tweet meme. So to paraphrase in our modern idiom the Titanic operators tweeted: @Californian Shut up, Shut up, I’m working @Cape Race. So the operator on the Californian soon turned off his wireless and went to bed. In about 10 minutes Titanic struck an ice burg. The Californian was only 4-5 miles away; but without the wireless communication they had no idea that Titanic was sinking. The Titanic wireless operators sent out the QED 35 minutes later and the closest wireless communicating ship was the Carpathia -58 miles away. My point, you wonder? The massive Hubris of the Titanic was not what killed 1,517 passengers. The real problem was not realizing the importance of the communication technology available at the time. The entire catastrophe could have been avoided, if the wireless operators had sent the ice floe message to the bridge. In all fairness, the real-time wireless connection did end up saving 706 mostly first-class passengers who made it onto the life boats. Ironically, these same passengers had sent all those personal messages that had filled the wireless spectrum. I talk to a lot of people who think Twitter is for mindless chatter, and it can be used for that; but talk to the folks who used it in Iran during the election protests and they will disagree. I speak to people who don't think we need a fully accessible and transferable EMR, and I then think of the nursing home residents who needlessly died after hurricane Katrina for the want of EMR/PHR access. In closing, I wanted to let you know there is a new hospital to visit in Western Maryland. According to their web page: "The new Western Maryland Regional Medical Center has officially opened our doors to begin providing tri-state area residents with comprehensive health care services in one centralized location on Willowbrook Road in Cumberland. This state-of-the-art facility rises seven stories into the sky, has 275 beds, and covers 585,000 square feet of interior space. Years in the planning, the new Medical Center was designed with patients in mind. Bright, spacious rooms have plenty of space for family and visitors. Nursing workstations are located just outside patient rooms so nurse can be close by. Free valet parking on weekdays and plenty of additional parking in our 955-space parking garage." Fred taught me how to look at movies: to appreciate them as stories and as commentary on our world. 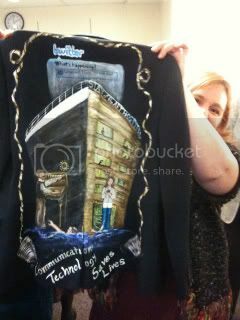 When Jen McCabe asked me design the art on a jacket for her to wear to conferences, I thought of the Matrix and how much it applies to the world of health and health IT. If you do not work in medicine or have not been touched by medical tragedy or chronic care, you are living in the matrix. You have a regular life where talk of EMR and PHR and HITECH may not mean much of anything. You might not even be aware you currently have to pay to get a copy of your medical record. But those of us who have been touched, know we are trapped within a Data-stream. When a medical tragedy occurs time stops. The matrix goes on and you are no longer part of it. You stand outside. You have fallen through the rabbit hole. Do you want to take the red pill or the blue one? Or like a good epatient to you go http://pillbox.nlm.nih.gov/ and find out what in the world are they asking you to take?